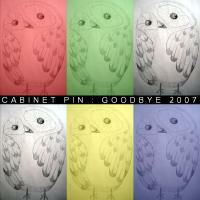 The Cabinet Pin 2007 end-of-year compilation is up at last, and is called Goodbye 2007. It has fantastic(!) new songs from Brave Radar, Bagley, Commas & Dots, The Saw Had Eyes That Sea, Fairy Light, Kane Black, Starlings in Snow, The Desks and Community Musk (who are all previous contributors to the 20th project). Head to the compilation and download the songs and some fancy CD artwork. Farewell the year in style!